Deserto de Viana, a sand desert in the northwestern part of the island of Boa Vista, Cape Verde. A lonely seaside on São Vicente island. Satellite view is showing Cape Verde, a group of islands in the North Atlantic Ocean. Praia the country's capital is about 660 km west of Dakar, capital city of Senegal's on the African mainland. Cape Verde shares maritime borders with Gambia, Guinea-Bissau, Mauritania, and Senegal. Related countries: Portugal. Cape Verde consists traditionally of two island groups, the Barlavento (windward) islands, including the islands of Santo Antão, São Vicente, Santa Luzia, São Nicolau, Sal, and Boa Vista; the Sotavento (leeward) islands with the islands of Maio, Santiago, Fogo, and Brava. The archipelago is of volcanic origin. But only on Fogo is an active volcano, Pico do Cano (or Mount Fogo), with 2,829 m (9,281 ft) the highest point in Cape Verde. 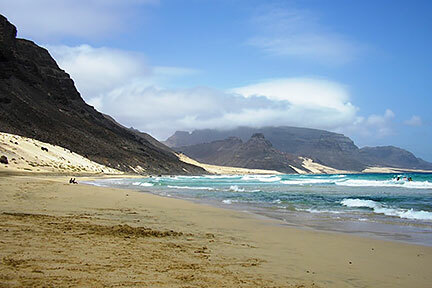 Cape Verde has a population of 525,000 people. Most Cape Verdeans are mulattos with mixed African and European origins. Around 95% of the population are Christian. Spoken languages are Portuguese (official) and Creole. The map shows Cape Verde with cities, towns, expressways, main roads and streets, and the location of the country’s international airports. Map of Cape Verde showing the administrative divisions of Cape Verde.